As a Disabled Veteran, Adams knows the challenges of living with limited sight. After suffering blunt force trauma while serving overseas he developer glaucoma. Over the years his eye sight has slowly deteriorated but he has channeled his struggles into an engaging series of books that are sure to inspire. D. K. Adams had a successful career in Sales & Marketing when he discovered that the blunt force trauma he suffered while serving overseas in 1962 was causing the loss of his vision. After 29 eye surgeries he lost complete vision in his left eye and was declared legally blind in 2009. With the help and generosity of the people of our great country, the Veterans Administration, and Southeastern Guide Dogs, afforded him the ability to embark on a new career as an author. 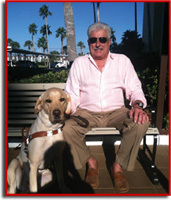 “Ace Guide Dog Detective” is his third book and the first in the Ace series chronicling their life experiences together. Ace and I have shared this last year, our first, together. I can’t begin to describe what a large part of my life he has become nor can I imagine my life without him playing his part in it. As I mentioned in this book, his primary goal is to outlive me, something I remind him of daily. As we continue our journey together I can’t help but think of those who allowed us this special opportunity. Southeastern Guide Dogs and the selfless dedication and training of Scott Lieser, his wife Emily, daughter Emma Grace and son Harrison who molded the first year and a half of Ace’s life into the exceptional being he is today. Also to the Kids and staff at Braden River Elementary School who raised $5,000.00 for the privilege of giving Ace his name. Ace is the ninth Guide Dog those Children have raised money to name. What a wonderful lesson they are learning in good citizenship. And how can I ever thank Alice Ryskamp enough who introduced me to Ace and trained us how to communicate. This is the first book in a planned series chronicling Ace and my life based on things that really happen as we travel down life’s road together. We both hope to see you again soon with are next adventure. © 2012 Ace Novels, Inc.